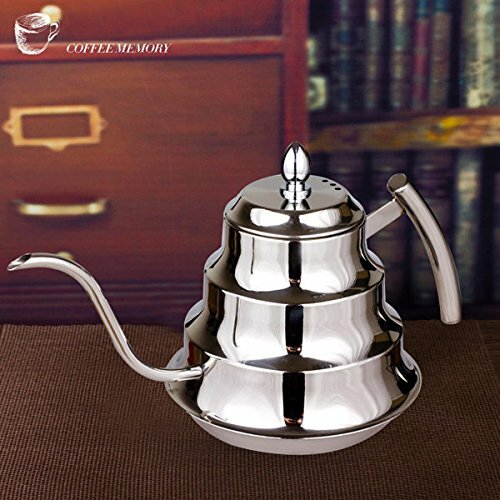 Description: 1200ML Stainless Steel Coffee Drip Kettle Tea Pot Coffee Pot Coffee Percolators This stainless steel Coffee Percolators have the large capacity of 1200ml, ideal for the enjoying coffee or tea, which can be used directly on gas, or electric stoves. High quality Stainless steel material, undulating design, light surface treated, there is a clean filter inside, its unique design makes it became one of the popular percolators for the coffee lovers. Specification: Material: Stainless Steel Color: Sliver Capacity: 1200 ML Size: 30x17x12 cm Package Included: 1 x 1200ML Stainless Steel Coffee Percolators. If there is a size or colour choice please email me with your choice or it will be sent at random.